Are Your Medical Costs Covered At Home? No one wants to be injured overseas. It’s not exactly what you were hoping for when making holiday plans. Unfortunately, it does happen and many travellers find themselves banged up in an overseas hospital for emergency medical treatment. Fortunately, many travellers have the foresight to arrange travel insurance. Most policies include cover for accidental injury or illness to the policyholder while they are travelling overseas. This cover extends to the cost of normal and necessary treatment for the injury or illness. This could include doctors’ fees, hospital charges, ambulance costs, physiotherapy, massage, medication and similar expenses. The policy will also pay for you to be repatriated back home if medically necessary due to your injury or illness. But what happens when you are back home? What if you find that you need further surgery or remedial therapy? Who pays for that? Travel insurance is considered a “door-to-door” cover. That is, with the exception of cancellation cover, the policy starts when you leave home to commence the trip and ends when you return home. This period of cover usually matches your trip dates – that is, the policy runs from your departure date to your return date. This means that once you have returned home, the policy ends and the travel insurer is no longer liable to compensate you for the cost of any further treatment. Every travel insurance policy carries an exclusion whereby the insurer is not liable for the cost of any medical treatment provided in your home country. This may sound harsh, particularly as the injury was sustained while you were overseas and insured under the travel insurance policy. It’s not that simple though and by law, the travel insurer is not able to help with the cost of medical treatment obtained in Australia. 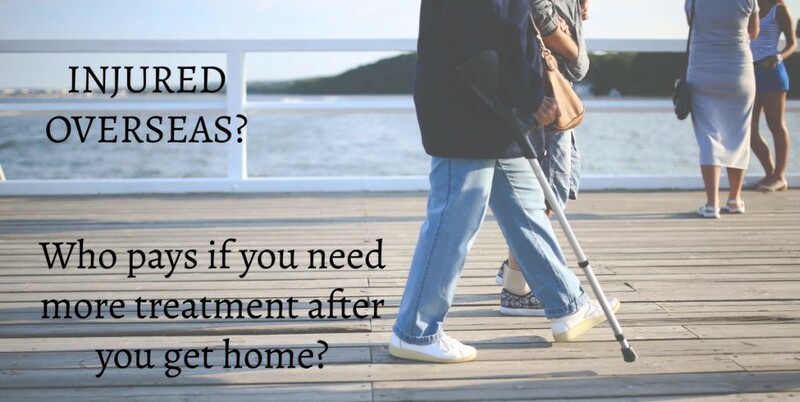 Once you are back home, your medical treatment is covered by Medicare and / or your private health insurance policy. You should therefore seek any further medical treatment you need via the Medicare system or the private health sector if you have private health insurance. Medical treatment in Australia is subject to various pieces of legislation – including but not limited to Human Services (Medicare) Act 1973, Health Insurance Act 1973 and Private Health Insurance Act 2007. It is only registered health insurance providers who are authorized to cover the cost of medical treatment obtained by Australians in Australia. Very few travel insurers are registered health insurance providers and so for them to cover the cost of follow-up treatment you need in Australia for an injury sustained overseas would amount to breaking the law. Travel insurance can cover you for the cost of medical treatment you receive overseas. It cannot though cover you for the cost of medical treatment you require once you have returned home. These costs are the province of Medicare or your private health insurer. Beware too if you are travelling domestically and purchase travel insurance. Similarly, no travel insurance policy will provide cover for medical expenses incurred in Australia while on holiday. Again, these costs fall under Medicare or should be referred to your private health insurer.